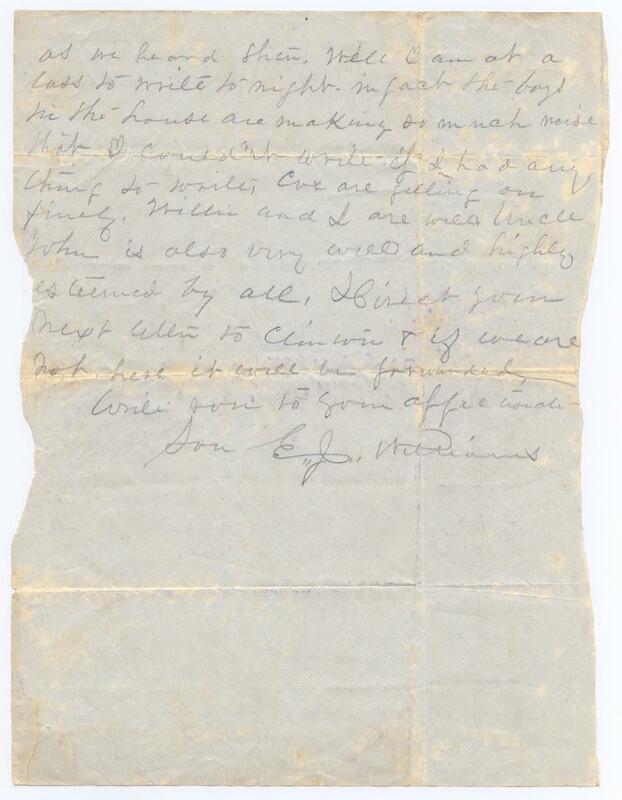 Item description: Letter, 7 July 1862, from Edmund Jones Williams (1841-1926), a soldier in the Fayetteville Independent Light Infantry and the 31st North Carolina Regiment, from a camp in Sampson County, N.C., to his mother in Cumberland County, N.C. Item citation: From folder 1 of the Edmund Jones Williams Letters, #866-z, Southern Historical Collection, The Wilson Library, University of North Carolina at Chapel Hill. Mr. Adams & his brother in law Mr. Hinds reached here this evening about sun set. They have come for the prpose of joining the Company. Mr. Adams tells me you have not heard from us since we left. We have written two & three times a piece, but I suppose had not time to reach you before he left. Our camp is a beautiful location at what is called [?] Mill Church. 8 miles north-east of Clinton in a very wealthy – & of course a pleasant neighborhood as it furnishes an abundance of vegetables and delicacies of many kinds. Very healthy so far. Our company engaged in a very sad duty on yesterday in escorting the remains of Lieut. Col. Faison to his last resting place. He was killed in the battle at Richmond while leading his Regiment to charge upon a Yankee battery. The community are now mourning the loss of one of Sampson’s brightest stars – a true gentleman & Patriot. The news we hear from Richmond this afternoon is not so cheering as was reported Saturday. It is very good – but not so good as we heard then. Well I am at a loss to write to night. In fact the boys in the house are making so much noise that I couldn’t write if I had anything to write. We are getting on finely, William and I are well Uncle John is also very well and highly esteemed by all. Direct you next letter to Clinton & if we are not here it will be forwarded. 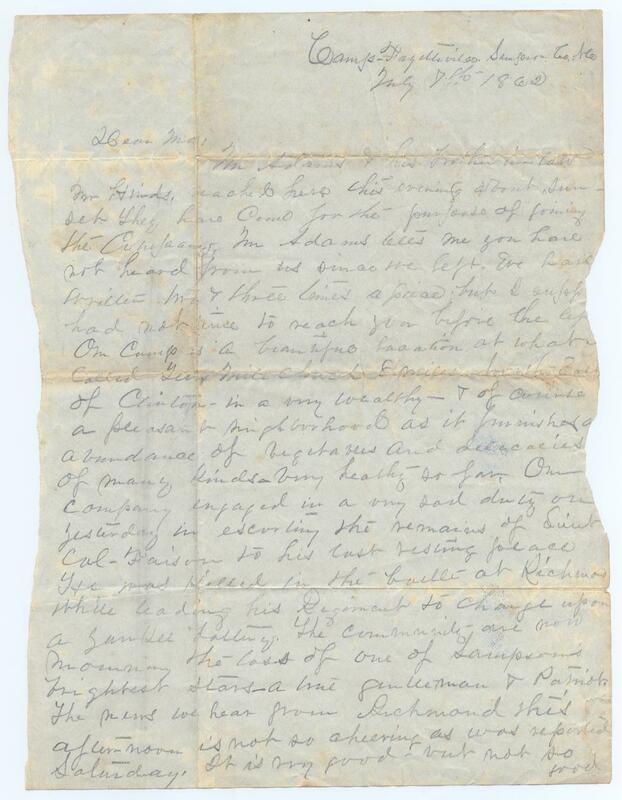 This entry was posted in Southern Historical Collection and tagged Clinton, Cumberland County, Edmund Jones Williams, North Carolina, Richmond, Sampson County, Seven Days Battles. Bookmark the permalink.